Creating a sustainable future for your business is your job. If you don’t do it, who would and who could? But leading a business in volatile, hyper competitive, and tough economic times is increasingly challenging. Sound strategic analysis, rigorous and productive strategic debate, swift and successful engagement and implementation are a must. 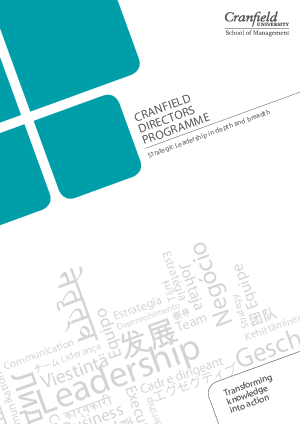 The Cranfield Directors Programme will help you ge to where you want to be. It builds your personal leadership capability. In this programme, Cranfield’s unique holistic approach to developing your personal, organisational, business and strategic capabilities stimulates your learning alongside experienced directors from diverse industry backgrounds.